The Ignis is the third offering to be sold from Maruti Suzuki’s premium retail chain, Nexa. It is also the most affordable product in Nexa showrooms today. It is aimed squarely at millennials, a rapidly growing segment, and therefore a product Maruti Suzuki doesn’t want to go wrong with. The prices are already out and the Ignis range starts from Rs 4.59 lakh and goes all the way up to Rs 7.80 lakh ex-showroom, Delhi. We’re in Chennai to drive the Ignis to see just what makes the Ignis a car for the millenials. The Ignis is appealing and unmistakable from the front and the side, but, sadly, while the rear is distinctive it isn’t appealing. The top half of the rear looks out of proportion with the flared wheel arches that gel seamlessly into the bumper. The boot is dead flat, and the boot-lid design is too busy for our liking. The plastic treatment on the rear bumper is practical, and makes a strong connect to the Ritz. High ground clearance and tall stance mean that you almost walk into the Ignis’ cabin, which appears roomier than what you’d expect from a hatchback of its size. Perceptible material quality at touch points has improved compared to the Marutis of yore, however fit and finish could still be better. The Ignis’ ivory and black dual-tone interior theme is likeable as it imparts the cabin a plush feel; however, maintaining it will require constant attention. Maruti Suzuki has followed in the footsteps of some of the luxury carmakers to simplify the dashboard layout by offering a standout 7-inch entertainment screen. It does look modern but could have been more driver-centric in placement. In the lower variants, a 2-DIN music system replaces the touchscreen, which doesn’t look awkward save for the orange backlighting that doesn’t go one bit with the classy white backlit instrument cluster. There’s a marked improvement in the quality of the aircraft style air-con knobs and steering controls over other Maruti Suzuki models. Another welcome change in the Ignis’ cabin is the new steering wheel, which is good to hold thanks to a non-plasticky rubbery finish. The audio controls on the steering wheel are also well-damped and easy to get used to. The Ignis is high on style and the doors get metal-finished door handles that are chunky and funky. 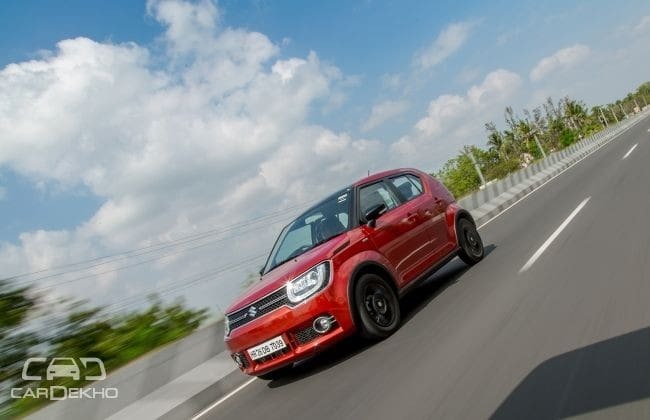 The doors appear heavier compared to other Maruti Suzuki hatchbacks of the Ignis’ size but don’t expect them to shut with ‘the thud’ that we love to hear on the Germans. The front seats are well contoured, offer decent under-thigh support, and hug you comfortably. View out is clear and the dashboard isn’t too sweeping as well, unlike most modern hatchbacks; so those with a shorter frame would get a decent view up-front, even on the variants that don’t offer driver seat height adjustment. The Ignis’ cabin is best suited for four people, although you can squeeze in a fifth passenger in the rear seat as well. The cabin scores high on practicality aspects with good legroom and headroom for all passengers and cubbyholes to store water bottles on all doors. The rear seat gets two detachable headrests and is 60:40 split, which ensures maximum utilization of cabin space for various needs. With the 260-litre boot, the Ignis already offers enough space to carry a weekend's luggage for four. The Ignis is available with a petrol as well as a diesel engine and all possible permutations you can think of with the 5-speed manual and AMT gearboxes. In fact, the Ignis scores on the very reason that it is available with an automatic gearbox with both the diesel and petrol engines. The petrol engine is the same 1.2-litre unit that powers the Baleno as well. It makes 83PS of maximum power and maximum torque output is 113Nm. The Ignis feels nippy from the word go as it is not a heavy car, weighing in under 860kg for the petrol and 960kg for the diesel. The petrol engine has good torque even at low revs and it really gets going past the 3,500 rpm mark. The manual transmission isn’t slick in the way it shifts, but it never fumbles the shifts. The 5-speed AMT unit, which is mated to the 1.2-litre petrol engine for the first time, has been specifically tuned to ensure silky shifts, and Maruti Suzuki has been successful in doing that as well. In auto mode, the transmission has predefined shift points shifting up around the 2,000rpm mark; however the transmission understands driving patterns and holds gears if the throttle input demands. It’s also quick at downshifting and so overtaking on the highways will not be a problem either. The combination of diesel and AMT is the highlight of the package. We’re told that the AMT has also been fine tuned for the 1.3-litre, 75PS diesel engine which delivers a peak torque of 190Nm at 2,000rpm. The net output is less jerky shifts as compared to the Dzire diesel AMT. However, the diesel Ignis AMT requires some time to get used to, as the turbo remains spooled at times and delivers power to the wheels when you intend to engine-brake. The transmission also upshifts at times when it judges a constant pattern, and it may take one off-guard especially when slowing down before making an overtaking manoeuvre. Nevertheless, you do have the semi-auto mode for the days when you need complete control over the reins. While the car upshifts on your mercy, downshifts are automatically handled to ensure the car remains on boil for the most part. In the semi-auto mode, you get a chance to reduce the jerks that are otherwise felt inside the cabin when the transmission upshifts. Time constraints meant that we couldn't take the Ignis out for a fuel-efficiency test however both the petrol and the diesel variants had promising numbers on the driver's info display unit. While the diesel remained in the high 18s within the city, the petrol Ignis topped at 20kmpl on a 50km highway stretch. For a car that stands tall, the Ignis has a well-cushioned ride. It rides on 15-inch wheels so it already gets an edge over other hatchbacks as far as ironing out minor road inconsistencies are concerned. Overall bump absorption is good with only the major ones filtering into the cabin. Surprisingly for a Maruti Suzuki car, the suspensions deal with the big potholes gracefully, without the crashing noise filtering into the cabin much. Since Maruti Suzuki is targeting the millennials with the Ignis, the car needs to score heavily on a lot of aspects, starting with the looks. The Ignis looks certainly like no other car on the road -- it’s attention grabbing and does a great job at it until it turns its face away from you. If you can live with it, the rear design is the biggest compromise you’ll make for this car. To cover up, you have a plethora of personalization options available as manufacturer accessory and the kitted-up Ignis certainly looks the part. On the inside, things are funky and modern with exterior colour coordinated elements to jazz up the cabin. The finish on the plastic parts has been improved to ensure the plastics aren’t as hard to touch as on other Marutis. The Ignis packs a lot of features in the top Alpha variant, however lower Zeta and Delta variants are decently loaded as well with convenience taking center stage. The cabin is spacious and comfortable, although maintaining it over time will require effort thanks to the light beige-black interior theme. Maruti Suzuki has hit the bull’s eye with the powertrain options on the Ignis. Offering the AMT ‘box with both diesel and petrol engines is a clear indicator that Maruti Suzuki has developed this vehicle for the youth who like to travel in comfort. With safety features as standard, the Ignis looks like a complete package not just for millennials but for a wider audience. While prices certainly appear to be on the higher side for now, the Ignis is one car that is ready to take the mandatory safety regulations leap. With its competitors and fellows yet to brace-up for the safety norms, the Ignis looks to have made a watchful start, but it is clear that it will play a long inning.